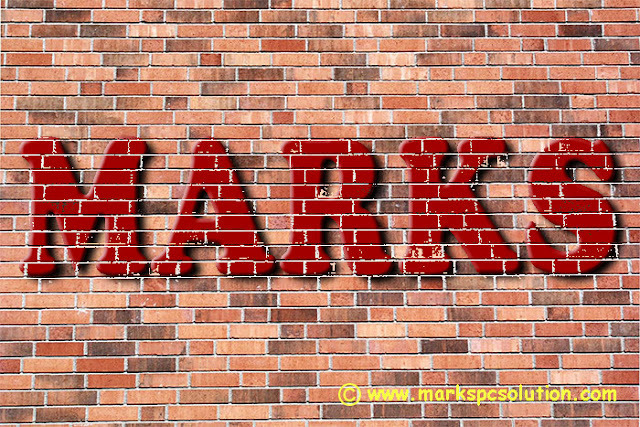 Blending Text with Brick Wall by Photoshop!! You can surprise your friends by writing their names on a brick texture. To make them surprised, you work must be accurate and realistic. 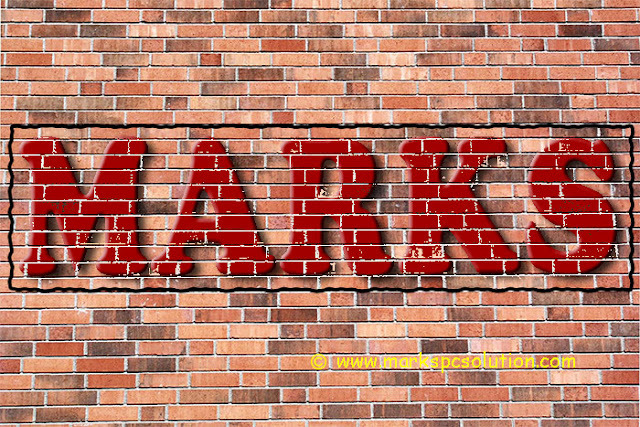 Today I'm gonna show how to blend text with a brick wall through Adobe Photoshop . . . Note: This tutorial is prepared on Photoshop CS6. Some options may not be similar if you're using older versions of Photoshop. 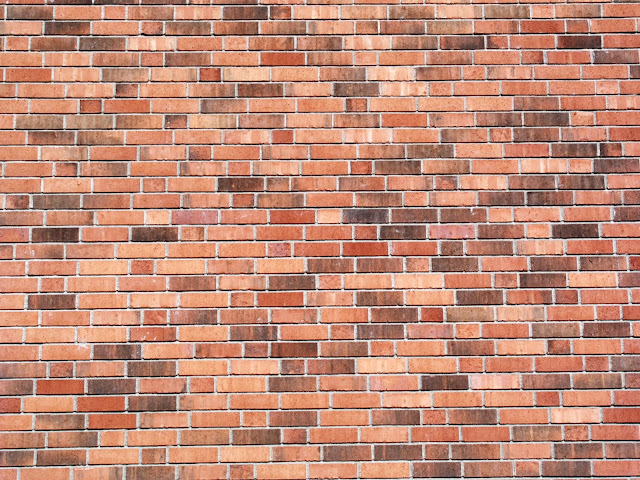 The very first thing you need is a brick wall. 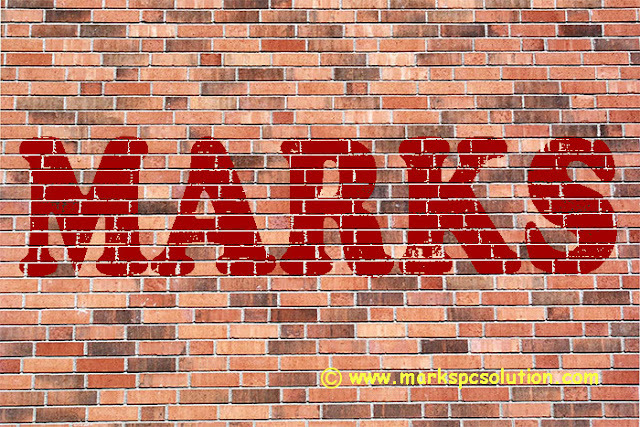 You can easily find one through Google search - Brick Texture or Brick Wall. Using a better image is very important since it may affect your output quality. A poor quality image may not generate a realistic view. So you can either use this image in your project, or find a better one. Choose a font which is thick enough. 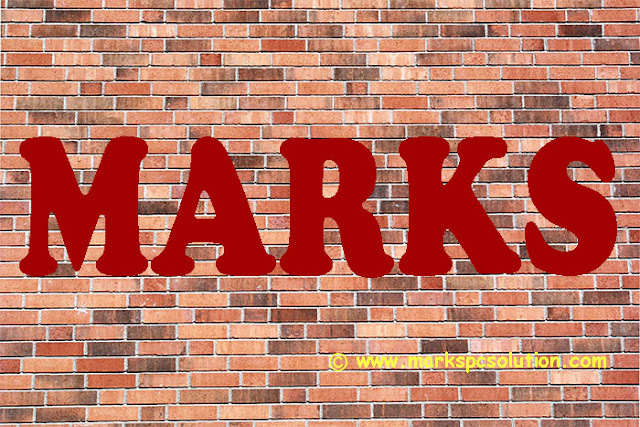 Our purpose is to capture as many bricks as possible in our text background. Or you can choose any other font which you prefer. But my suggestion will be - choose a thick or bold font. Run Photoshop from your PC. Press Ctrl + O > Choose brick wall and open it. Press T to enable Type Tool. Choose a font - Cooper Black. Choose a brown color. Color code is # 990000. Make sure your text layer is selected in the layer panel. 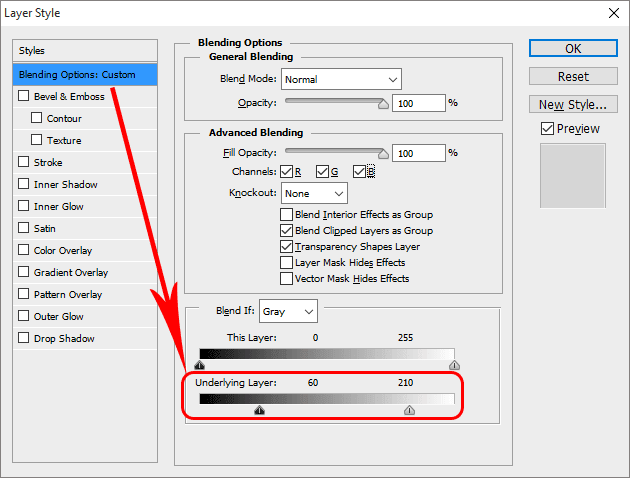 Now hit on the fx button from the bottom of the layer panel > Choose Blending Options > Now you will get the Layer Style window. Look at the above image, you've to use the Underlying Layer. Set the left slider to 60 and right slider to 210. Third Phase - Optimize the look . . .
Hit on the Bevel & Emboss | Style - Inner Bevel, Technique - Smooth, Depth - 100, Direction - Up, Size - 5. Keep the Shading part untouched. Hit on the Drop Shadow | Blend Mode - Multiply, Opacity - 75 to 100, Angle - 1450, Check Use Global Right, Distance - 8, Spread - 5, Size - 9. All done! Hit on the OK button. This is your final view. From the Layer Style window, you can set different values for different options and get different result. Final Phase - Wait a minute! Wanna get a view like this? Simply draw a rectangle around your text. Set the Fill value to 0%. Make a right click and choose Blending Options. Choose Stroke | Size 4, Outside, 100% Opacity > Hit OK.
Go to Filter > Distort > Ripple > OK. That's it! You should download this project file for better understanding. Thank you for visiting us . 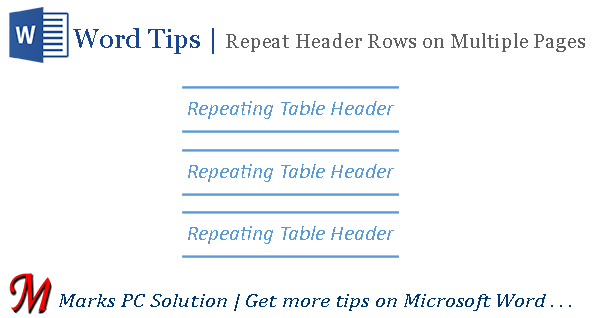 . .
How to Repeat Table Heading in MS Word? When you're working with a large table that is supposed to be divided into several pages, you may need to use the same heading on every page. And whenever you make any adjustment, you may face problem with the header rows. 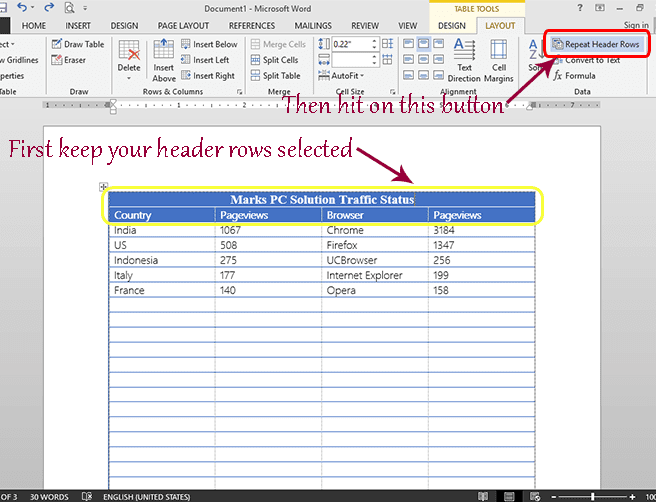 In MS Word, you can easily get rid of this problem through Repeat Header Rows option. Note: I've prepared this tutorial using Word 2013. You may find bit difference if you're using Word 2010 or 2007. Often you may need to add/ remove some rows from a page, consequently the header rows of next page will move upward or downward. And every time you make any change, you may need to edit those header rows again. That's quite intolerable! In Microsoft Excel, you can use the Freeze Panes option to do this. Repeat Header Rows in Word - Follow the image below . . .
Run MS Word from your PC > Create a new document. Create a table from the Insert tab. As soon as you create a table, you will get two new tabs under Table Tools - Design & Layout. We've to use the Layout tab. Select your header rows (Either 1, 2, 3 or more rows, but it must include the first row of the table). Go to the Layout tab and choose Repeat Header Rows option from located in the Data group as shown in the image below. That's it. Now increase the number of rows by pressing Tab button. Or keep working normally to increase the number rows. As soon as your table goes to the new page, your selected rows will be repeated there automatically! Come on! It's a magic - share with your friends. Header rows will be repeated in every pages automatically. Automatic Header Rows will be visible in Print Layout View, Reading View and when you print the document. But it will not be shown when you're working in Web Layout view. When you create a page break manually, repeating header rows will be stopped there. You can choose multiple rows as header rows, but the first row of the table must be selected. Windows 10 has come with some new settings and applications. So, there are little changes in the use of Keyboard Shortcut. Microsoft has released a document including shortcut keys which are 100% compatible with Windows 10. 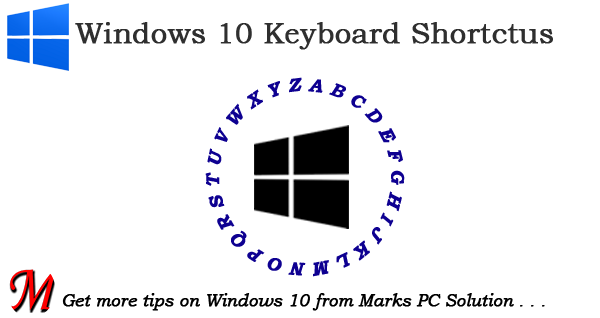 Most of the above shortcuts will work with Windows 8.1 and 8. And some of them will also work with Windows 7. The shortcuts which are related with the new settings of Windows 10 will not work with older versions of Windows. 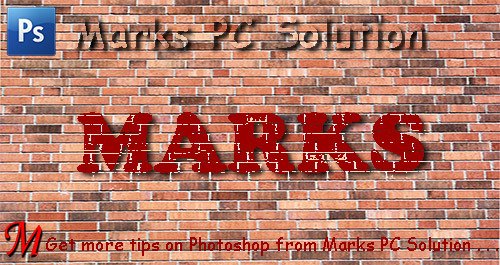 Stay with Marks PC Solution to get more interesting tips . . . 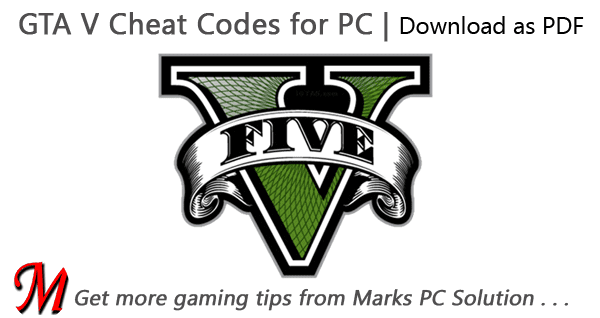 Here I've collected some cheat codes for those who are playing GTA V on their PCs. Though it's the largest game of Grand Theft, it doesn't have as much cheats as San Andreas. GTA V is the latest game of GTA Series. This game has been quite popular among the gamers. But it hasn't reached to all due to its large installation file and heavy system requirements. Cheats need to be activated by pressing the tilde button (~) of your keyboard. Spaces are not allowed in the codes. They are just to help you memorize them quickly. You can also download the cheat codes as PDF. In this file, I've included both PDF and XPS document. And it's 1.1 in size. Certainly this will boost your GTA V experience! Enjoy the cheats . . . While I'm talking about this converter, some of you may think, I can use snipping tool to capture image from that PDF file. But think about a large document where are more than 20 pages need to be converted. And you can't see a whole page in your monitor. That's why you need this converter. If your document has 30 pages, it will create 30 different images from it! You can download each image separately. And you can also download them at once as ZIP file!! First, visit - PDF to JPG Online Converter. You will find the interface as shown in the above image. Hit on the Choose a PDF file button to find and select your PDF file from storage. Choose desired JPG quality level (Good - 150 dpi is recommended). Hit on the Convert PDF to JPG button. Now your PDF document will be uploaded and converted. Finally, you can either view or download your desired image. You can also download the picture as ZIP file! Your document has been processed! You can download JPG pictures or ZIP file. Hope all of you've enjoyed this post. And I think you can use this online tool conveniently as and when required . . . Host Files on Userscloud - Earn Extra Dollar!! Userscloud allows you to host your files, images or videos on their cloud storage. You can use their unlimited hosting service at free of cost! And if you upload your downloadable contents, you can even earn extra money!! Userscloud users enjoy following benefits . . . Earn extra cash (Referral commission is also available)!! Payment Information . . .
Payment Method - Only PayPal is supported currently. Payment Threshold - Minimum payment threshold is $5. Payment Time - 30 days after requesting the payment. Sign in to your userscloud account. Here you can upload your files. To upload from another site, you can use Remote URL upload option. To view your files, go to My Files tab. To view your account information, visit My Account tab. You should notice that Google is showing a new doddle in its homepage since yesterday. Have you played this yet? It's nothing but the new logo of the search giant! Last night I had just visited Google's home and discovered this! It's not the first time, Google changed its logos and icons. We've noticed such changes before. But this time, it's really fascinating. Google has just used its doddle feature to introduce the new logo. First one modified in August 1998. Same logo modified again in September 1998. In May 1999, Google introduced a more sophisticated look! After a long break, it was changed again in May 2010. And the logo we used to see the day before yesterday was introduced in September 2013. And the latest logo has been introduced on September 01, 2015. To see the detailed history, go to Google and search - Google Logo History. There are basically 3 changes . . .
Google Plus Button icon has also been changed! 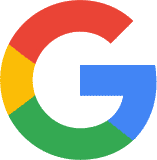 This is the new Favicon of Google which will appear as tab icon when you visit Google. And this will be the voice search icon which will appear in the search box. It was fully black before. Tech people have showed mixed reactions to these changes. Some people are excited by these changes, some are thinking it as unnecessary. But I think changing things is not a bad idea! If you regularly update your products and services, people will realize you're active - you're with them! That's what Google has done!! Have a look at the GIF image below!